With the sun shining over the weekend, close to 150 000 people visited the historical Lonsdale Street Greek Precinct to enjoy the best in Greek music, dance, food and fun. During the opening ceremony on Saturday night, the President of the Greek Community of Melbourne and Victoria, Bill Paperstergiadis said the festival continues to grow in strength thanks to a dedicated team of organisers and even more enthusiastic volunteers. He also thanked the representatives of all levels of Government that continue to show their support – not only for the Lonsdale Street Festival but the Greek community in general. The festival’s reach has grown beyond Melbourne’s borders, with more than 800,000 people engaging with the festival’s social media content over the course of the campaign. Just over 400,000 people tuned into the livestream content over the weekend, with viewers from as far Europe and the USA able to participate in the fun. 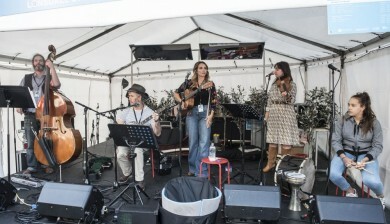 The highlight on the street – and online – was Greek singing sensation Eleonora Zounganelli’s first Australian outdoor concert. Her melodic voice had the crowd dancing till late on Saturday night. Melbourne’s biggest street party and longest-running Greek festival brings together some of the Australia’s most talented performers, dancers, chefs, cooks and competitors for a weekend of Greek-flavoured entertainment. Headlining the event will be one of Greece’s most popular singing sensations, Eleonora Zouganeli, on her first Australian visit. Since 1987, the festival (formally known as Antipodes) has taken over the historic Greek precinct in the heart of Melbourne to celebrate the best of Hellenic culture. Over the years, thousands of performers and dancers have taken to the street to showcase the best in traditional and modern Greek dance, while hundreds of competitors have tested their endurance with Zorba ‘Til You Drop in the hopes to win a trip to Greece. Some of the best in Greek entertainment, including Glykeria, Giannis Haroulis, Michalis Xatzigiannis, Alkinnos Ionnidis, and Pandelis Thalassinos, have kept the crowd dancing in the street into the early hours of the morning. In 2018, the festival expanded, extending from Swanston St through to Exhibition St, offering three performance stages and more food and fun for people to enjoy.